Potential Extra Fees upon check-out --Replacement cost for any missing/broken/damaged items or if any Extra cleaning is required. Once again, my wife and I stayed in this Condo. It's like going home for us now. Easy to get around from there and everything we could possible need, including magnificant views. This is our second stay in this Condo and we will most definitely be back. The expansive views at the Ilikai Marina Unit 1590 awaits you from almost anywhere in the unit. A set of sliding glass doors open onto the intimate lanai which gives you an unobstructed view of the yacht harbor and a breath taking view of Pacific Ocean. This is a rare view in vibrant Honolulu. Enjoy a fireworks display from the lanai every Friday night. The living room includes a queen size sleeper sofa, Brand New Flat Screen TV with cable, and a DVD Player. The dining area at the Ilikai Marina Unit 1590 has gorgeous ocean views. 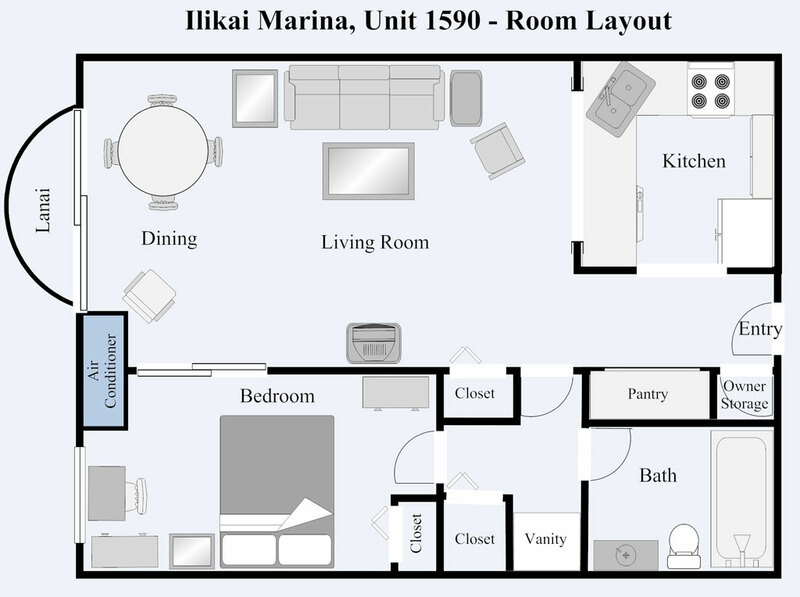 The bedroom at the Ilikai Marina Unit 1590 closes off completely from the living room. It has a Queen size bed that you can lie in and enjoy the ocean views. Great view of the Marina, Sunset & Fireworks! On the quieter end of Waikiki. Walking distance to Waikiki Beach and Ala Moana Beach Park. Condo was clean and kitchen had everything we needed. Would definitely stay again. Great condo view but needs a little modernization to the unit. Also, the twin bed in the room should be a queen size. Thanks for the review for unit 1590 at the Ilikai Marina. Thank you for mentioning the great view as it is pretty amazing! The sleeper in the living room is advertized as just large enough for one person since the condo only can accommodate 3 people total. Therefore a queen size is not needed in this condo. The website does depict the condo as it exactly is so the decor and finishes are very well presented for any guest to decide if this condo would be of interest to them. Place was nicely appointed. The only issue we had was with the bed- it’s horrible. Thank you for your time in posting a review for unit 1590 at the Ilikai Marina. This condo is a great and very accommodating location with amazing views! We are sorry you did not feel the bed was comfortable. Beds are very specific pieces of furniture in that every person desires different mattress types in which we of course cannot accommodate all. We often in different units we represent have had very contrary comments on beds where one person loves a bed and another does not think it was comfortable. The stay in 1590 was wonderful and pleasant very close to activities spectacular view. My husband and I have been staying at both the Illakai and the Illakai Marina for a few years now and have never had a bad experience. Whilst the apartments we have stayed in at the Marina appear to be more dated, they are always clean and we have not had any issues. We will continue to stay there for our visits to Hawaii. Perfect Location and Spectacular Views! The location of this condo was idea...near the activities of Waikiki Beach, and also close to Ala Moana Beach Park - which is ideal for joggers or a great walk. The views were absolutely the best...and made the entire experience wonderful! This condo is in a super location in Honolulu. It was a 20 minute walk to Waikiki, or a 5 minute Uber ride. We loved looking over the marina, and enjoyed a great dinner at the Chart House restaurant in the same building. Parking was easy, kitchen appliances all worked well. Now for the bad part-this condo is old. It needs some major love in the form easy cosmetic updates. For example, a new paint job-there were major paint dings on the walls everywhere. The carpet is very very tired. The bathroom tub/shower area needs to be replaced and/or new caulking and paint as soon as possible. The queen bed was lumpy and the comforter old and tired. Very old linoleum in the bath and kitchen areas. We weren’t in the condo much, so I was able to overlook this, but need to let other vacationers know. I was disappointed with these issues, worse than many Super 8 motels. A great spot-please update the space. We appreciate your feedback for the unit 1590 at the Ilikai Marina. It is a really great location conveniently located just where you want to be. The views from the unit are unbeatable and there are lots of restaurants in close walking distance. Waikiki Beach is just across the Marina parking lot and just takes about 5 minutes to reach walking. The Hilton Lagoon is also a nice attraction for cooling off in the same location. We appreciate your feedback on the unit and suggesting some updates. However this unit is individually owned so the owner would then have to increase prices to cover the costs. The current reasonable rate is a nice option for some to get a condo that has a full kitchen and is accommodating for a stay in a perfect location with a great view! We thank you again for your feedback. Fabulous views! Condo was in the heart of everything so you don't need a car. Condo was equipped with everything you need for a wonderful stay. We would definitely stay here again! The views are great aren't they! We appreciate your review and taking the time to post. Thank you for all the great comments and we are glad to hear you will return! The location was very good for our needs. The condo itself, however, needs some updating. New carpet, refreshed bathroom, linens and furniture would help. Additionally, the internet connection instructions were incorrect and we could not access the unit or building wireless network. Thank you for taking the time to post a review for the unit 1590 at the Ilikai Marina. Thank you for noting the great location as it is very convenient to everything! The condo itself is clean and does have what one needs. If updated more the very reasonable pricing would have to increase and there are not many pricing options in this range around. We wish you would have contacted us about the wifi as we could have helped with that. Anytime the guests call about the wifi in any of the units we represent, we can either step them through it on the phone or send our on island contact over to help which we are glad to do. We stayed here for 3 days. The condo itself was ok. It had everything we needed. There were no issues checking in or out. It would be nice to have parking included rather than spending $20.00/day. I understand this is the city but for renters it would be nice to include. We spent most of our trip on the North Shore and preferred that area. Waikiki is very busy with a lot of people. When I booked I thought the beach was right in front of us but the marina is right there. The beach is just a couple minutes' walk so not a big deal. The lanai is very small. There are 2 chairs but it was hard to relax when that is all you can fit on it. It served our purpose for what we needed. It would be great to include a larger TV and add one in the bedroom. I would say stay here if you are staying under a week or have a specific purpose for being there that is not vacation. Thank you for posting a review for us for the unit 1590 at the Ilikai Marina. We are glad you found everything you needed in this unit. No matter where you go in the city, parking is not free for hotel accommodations. However the public garage you spoke about at 20 dollars per day is just one option. The Marina parking is 1 dollar per hour and there are some curb side parking in different areas that are free if you happen to get a space. Considering the very reasonable price for this condo it even with the parking is a deal! Yes Waikiki is a big city and has all the attributes associated with a big city including people. People who are attracted to the city enjoy this atmosphere and all the conveniences of the multiple shops, restaurants and activities. They like being where the action is. The pictures on the website for unit 1590 does show the view from the lanai and that it overlooks the Marina and Ocean beyond. However you are very close to the Waikiki Beach just over to the left a very short walk. The website also shows the picture of the TV and the Lanai space which we want all guests to have a complete overview of this unit to make a decision if it is right for them. Mahalo to Kristen and her colleagues for providing clear and detailed instructions before, during and after our visit. The condo is conveniently located between the main tourist district of Waikiki and Ala Moana Shopping Center. Although there is a garage in the building (there is an additional fee), the condo is next to bus stops connecting to other points in Honolulu. The view over the Ala Wai Yacht Harbor is stunning; you have a panoramic view facing south, and you have an unobstructed, front-row seat for the Friday evening fireworks at the Hilton Hawaiian Village. The apartment is a 2 minute walk to the beach, and a 10 minute walk to the Ala Moana Shopping Center. There are a few convenient food options nearby. For a good, coffee-shop style breakfast, head to Cinnamon's at the llikai. For more upscale tastes, the dining options at the Modern are quite pleasant. Both places are accessible via a footbridge from the second floor. The condo was very tidy when we arrived. The layout and convenience are wonderful; a full kitchen, as well as Internet access. The price point is ideal, too. I felt like I paid a very fair price for the level of accommodation. The apartment is comfortable but not luxurious. Having said that, I do have a few small suggestions for the unit owner. I think a small "refreshing" of the amenities would benefit future guests. While the apartment is clean, it is showing a little wear: the carpet could use a deep cleaning, the bathtub had signs of a little mold, and the apartment could use a coat of bright paint. Linens and kitchen items could use an update, a quick trip to Walmart or Target could take care of this. However, these details did not detract from our stay. The condo building is well-maintained, with evening security. I would advise staying on a high floor if you are disturbed by noise. The Chart House restaurant and the Harbor Pub closes late each night, and some of the lingering guests made a little noise. The other guests and tenants of the building are courteous and respectful. All in all, I would happily return to the Ilikai Marina Condo. Mahalo for a great stay! We stayed here for a few days around Thanksgiving as a staycation and we greatly enjoyed our stay. The condo was fully equipped and had a terrific view. We actually enjoyed the slightly outdated look as it had the Aloha vibe. Watching the fireworks from the room was amazing and located in a great location. We also loved the ease of accessing the property without having to do a hotel checkin. There are plenty of places to eat and shop nearby and we loved the location. It is also a short walk to the mall which is nice. We definitely plan to have another staycation in this condo! Thank you for your review of the unit 1590 at the Ilikai Marina. We love hearing about how you enjoyed the unit and the location and hope you can come back again soon! Excellent location....right on Waikiki. Enjoyed our stay. Could do with an update... but did not affect our stay. Looking forward to the return our security deposit. Thank you for your review and taking the time to post. We are always happy to hear when guests have enjoyed their stay at unit 1590. It is the perfect location and the views are exceptional. We hope you can return. A wonderful stay in this apartment. Views could not have been better. Apartment was clean and had everything one needed. Will use again.Couch a bit warn....needs a new cover. Thank you for taking the time to post a review. We are glad to hear the condo had everything you needed and yes the views are pretty amazing! Thank you for your suggestions. We do hope you will return! Thank you for taking the time to post a review. We are glad you found the condo clean and orderly. We wish you would have called us about the sleeper as we could have helped with that. Also we would have been available to call about anything. Our numbers were provided for you not only in all the email correspondance but also on the sheet posted in the unit itself even if it is after hours. Vaction rentals typically do not have maid service so we provide a couple towels per person and then you can get them refreshed with the on site laundry facilitiy. The resaonable rates, the location, and the views make this unit a great option on a budget. The location is great, marina, park and lagoon within 5min walk. Great view from the small lanai, best view of Friday fireworks show other than a helicopter. The condo itself is very basic and the furniture could be nicer, but at this price point it was very clean and comfortable. If you want super nice finishes and furniture this is not the place for you, but if you want a clean budget friendly option this is your pick. My wife and I loved our time here and spent most of our time enjoying the surrounding area so this place was great! Only reason I did not give this place 5 stars is because it was what I expected, not more than I expected, would not hesitate to book again. The condo was very clean, and equipped with everything we needed. The VIEW was amazing. We slept with the window open every night. The only minor thing is that I wished the elavators was a little faster. BUT everything else was great. Thank you.. Thank you for your review and taking the time to post for us. Thank you for your comments about the great location the lovely unit and you found it to be clean and without problems. With the great review, we wonder if you ment for it to have only a 2 rating? Thank you for your kind comments. We loved our stay at aloha condos. The location was excellent. The decor is tired but everything we needed was there and it was lovely and clean. We had no problems at all. This was our 4th place to stay during our 3 week vacation to The Big Island and Oahu. The view from this condo is fabulous and the location is very hard to beat. The condo itself is tired and could use some updating and it would be nice if the kitchen was equipped with a few more dishes and mugs. We appreciate you posting a review for the unit 1590 at the Ilikai Marina. The views are pretty special and you are right about the location as it is close to everything! The unit is clean and updating it would increase the very reasonable price which makes it more affordable for more people. I will mention to them about looking at the dish and mug count. Thank you for your business and we hope you will be able to return in the near future. Condo could use a freshening up but overall was great. The view from the room are spectacular.The Ilikai Marina is a great place to stay. We will be back in October to enjoy the views.. Thanks for the review for the unit 1590 at the Ilikai Marina, The views are very special and the great rates do allow you to have the water view location at a reasonable price. We are glad to hear you will be coming back again. Thanks for your business! The condo was in a great spot, amazing views of fireworks and sunset, away from the bustle of Waikiki, but very close to beach and shops. Very comfortable and spacious. Recommend restaurant in hotel across the street, fabulous food, a hidden gem, with great views. View from the room was beautiful. Location was good apart from the noise from the airport which you could hear occasionally. Mattress needs replacing as you can feel the springs. Had a sliding room separator which is good for privacy if you have more than two people. Overall for the price we were quite happy. Not fancy but had the facilities needed. Could do with a bigger television as there was only one small one in the living room without a working remote but we did not spend a lot of time in the room so it didn't bother us to much. Another good thing was that wifi was included in stay. Overall if you are on a budget this place is pretty reasonable for what you pay and parking is available for $20US per day at the hotel which was super convenient if you are going to hire a car. Thank you for responding to our request for a review on your stay at unit 1590 at the Ilikai Marina. The views are pretty amazing and the location cannot be better. The airport is about 20 to 30 minutes away but staying anywhere in Honolulu/Waikiki would be the same. Thank you for mentioning the affordable pricing and the unit had what was needed and some features you liked. We usually have not had complaints about the bed but we will get someone to inspect the mattress. Great view from the condo, located in an excellent location. Other than that, the condo is old and in desperate need of an update. The bed sheets had blood stains, paint was peeling off walls, and there was zero communication from condo owners. Wouldn't stay here again, the view doesn't justify how old and run down the condo feels. Would have loved to have heard from the condo owners to check on how we were doing and to see if we needed anything but that never happened. Spend the extra money to stay at one of the hotels or another condo. Thank you for your review and taking the time to post. You are so right regarding the location and the views! The location is right where you want to be and the views of the ocean are amazing! The condo is exactly what the website pictures show and we try to post multiple pictures so people know exactly what to expect. We wish you would have let us know about any stains on the sheets as we could have sent a housekeeper by there to get you some new ones. The sheets in that unit have been replaced recently so most of them are brand new. I have asked the housekeepers to go through all the linens and throw out any linens that might have any stains to follow through with your comments. We are in contact with the guests through multiple emails leading up to their arrival, including multiple instructions, notices and wishing you a wonderful stay. Once you have arrived we do not contact the guests, unless of course you call us. We are very responsive to our guests needs and questions and are very open to emails and or phone calls as our phone numbers are given to you in muliple locations. We also have more than one point of contact helping in assuring your calls will be answered and any needs met. Very clean but really needs a facelift. Great location of the condos. This condo was very shy of supplies like cups and even basics like a good sharp knife. It really needs a facelift and a Reno. Overall great value and location! Thank you for your review and taking the time to post for us. This condo does have very reasonable pricing and is in a great location close to everything! Thanks for mentioning the kitchen supplies as we have just recently been doing an inventory and purchases are being made to update the supply. We hope you can come again soon! Our experience at this condo was wonderful. Everything we could have needed was there. The location was perfect for all the things we had planned. After looking at many condos, homes, and hotels online we kept coming back to Ilikai Marina Condo. We are so glad we did. Very comfortable room for my husband and myself along with our grown son. The view is fantastic. Parking although a fee was convenient. We had no problems, we have no complaints, if we go back to this area we would not hesitate to stay here again! I stayed at condo 1590 despite the two poor recent reviews and I must say the place is absolutely fine – no issues whatsoever. It all depends on your expectations. The pictures show you exactly what you get and the place is fully equipped. The size of the TV or the quality of cupboard doors is not an issue for me – I came to visit places in Hawai’i and this condo is a perfect basis for this. It has a fantastic view and sunsets, a central location and on Friday evenings you have a great view of the fireworks. I enjoyed my stay. Thank you for your review and giving your feedback on unit 1590 at the Ilikai Marina. We do post multiple pictures so that our guest do see exactly what they are booking. We are happy the unit worked for your needs and you did enjoy the incredible view of the ocean, the sunset and the fireworks on friday night. Please come again and thank you for your business! We have stayed at the LLikai Marina condos four times in three beautiful condos .Unit 1590 was by far the least impressive.The furniture is old and uncomfortable.The TV is a 23 inch.This is a condo that is a good crash pad for someone that is not going to spend much time at the unit. The kitchen is fully equipped with ever thing needed to prepare meals.The best thing is the view of the marina and ocean. Thank you for taking the time to post a review for the unit 1590 at the Ilikai Marina. This unit is very reasonable as you have mentioned and does meet all the needs for accommodations. The full kitchen adds even more advantage being able to cook in and prepare meals. Just looking out the windows and enjoying the views from the lanai make it a special experience. The condo is accurately shown on the website. It was a decent place, albeit, somewhat tired. It was disappointing that the kitchen was quite poorly equipped. Everything is there, but not the caliber I am used to. We think it is pretty basic to have matching wine glasses, matching utensils, attractive serving platters. Luckily we were able to receive some better wine glasses..only had three mismatched and one was cracked. Thankfully the dishes were a set. Beach towels poor, but we did receive new one. Thank you!Our friends were in the Ilikai and their condo (1608) was stellar. I travel a lot and often rent condos and private homes all over the world. I cannot recommend this unit to friends. Thank you for taking the time to post a review for the unit 1590 at the Ilikai Marina. We understand as you have mentioned that everything was there that was needed and that the wine glasses were provided. This is a very reasonably priced unit making it very affordable and accommodating with all that you need. We are glad that we were able to provide you also with another beach towel as requested. We our very best to accommodate each guest with any concerns. We had a wonderful time. We enjoyed the condo-- it had everything we expected it to have. The view was really lovely-- we were comfortable and were happy to call it home for a week. The only things I would note-- the TV is rather small-- although it worked reliably and easily. Also our second set of towels smelled a little mildewed and the deck door didn't lock-- we weren't worried about this because we were so high but it is theoretically possible for someone to pass from deck to deck.... All in all we were quite satisfied and would definitely stay there again and recommend it to our friends. Stayed at the end of November and was not disappointed. Very well located just a single bus ride (no transfers) from right outside to anywhere we wanted to go. SUPER close to the beach, marina, lots of restaurants near by.... lots to do! The condo itself was a good size (very comfortable for the three of us), came with everything we needed and was clean and pretty up to date. The view was to die for! Highly recommended, would love to stay again! Thank you for posting your review for the unit 1590 at the Ilikai Marina. This condo is location in a very convenient location, close to everything as you mentioned. We appreciate your comments on the cleanliness of the unit and the fact that it had everything you needed. The view is amazing! We hope you will return soon! Good location with public transportation easily accessible. Spacious condo for 2 people staying for a longer stay than 3 nights. Old I have no problem with & slightly used, but cleanliness is important. The tub had darkened rings around it. Hair on floor. The price per night was very reasonable for Oahu. The check out cleaning fee was unreasonable I felt. We leave places cleaner than when we arrive as a rule. Did it take $135 US / $181 Canadian currently to clean the condo after us? If it didn't, I know that I would appreciate a portion of it back. Aside from this would have appreciated a couple more facecloths. We loved the view overlooking the Marina out to the ocean. We would consider renting here again if we come back to Oahu. We do appreciate our guests posting reviews from their stays with us. This condo is in the perfect location, has incredible views and is spacious and well equipped. If we had known that you had some issues with the cleanliness, we would have sent someone over right away to remedy the situation. We do want to make sure our customers have a comfortable stay with us. The fee we charge for the out cleaning is what the contracted cleaners are paid for their services. These are individually owned units, therefore the cleaning is not part of a hotel or service but contractors who come in for the clean, who get paid per clean. This is their charge and is paid whether the unit was booked for one night or one week. The unit still needs attention in every detail to prepare it for the next guest from linens to bathrooms to kitchens etc. Even though towels are provided, there is not a maid service in this unit. Therefore, if you would like them refreshed, there is a laundry facility in the building on the 8th floor for the guests to use. beautiful location and view... fun watching Hawaii Five-O film shoot... warm water for swimming... nice time. Thank you for posting a review after your stay at the Ilikai Marina unit 1590. It is a perfect location and the views are pretty special and add to the whole experience. As you mentioned the marina area is one of the Hawaii Five O shooting spots so if you are lucky you can see them on location. It also is a great spot to see the Hilton Hawaiian Village fireworks on Friday night. We hope you can return again and let us accommodate you once more. The view is spectacular! We stayed a week for our honeymoon and loved waking up to that panoramic view. The entire condo was clean and neat. The ac unit was old but works great! Short 5 minute walk to Waikiki beach. Downstairs dining at Chart House is perfect! We love the one here in Oregon so we were happy to find out one was just below our condo with also a beautiful view of the marina. I would like to suggest that although everyone pays a cleaning fee, that you should look into not only the surface cleaning, that the first impression was a stale smell in the condo it was a old dirty ditched in smell, I think the blankets and quilt needs dry cleaning and a new sponge underlay on the bed, and some freshener in the carpet I could not get passed this odour, and the superb view that we were supposed to get of the Marina was just murky, brown dirty water that smelt, but I suppose you get what you pay for !!! very disappointed really. Our 15th floor, ocean view condo proved to be just what we were hoping for. The marina view; the nightly sunset; the Hilton fireworks clearly viewed right from our patio; the beaches available so close both to the left & right of us were very convenient. The house keeping staff were so warm, friendly and efficient. Red Lobster & IHOP were right near by. Several free Hula shows were available near by as well. We loved the fact that we didn't need to rent a car. The City BUS stop was close at hand($1 for Srs). Our room was very quiet even though we were near a lot of action. Only one thing we missed: No Swimming Pool. We stayed in this condo three nights. The condo was well furnished and well equipped. Everything was clean and maintained. The ac worked but was only needed during the day as the evenings were cool? The location was good, within walking distance to Ala Moana mall, places to eat and bus stops. The view from the small balcony was over the marina, the Pacific and toward Honolulu. It was a very enjoyable stay. Would not hesitate to book this accommodation on my return to Hawaii. The location is fantastic with wonderful views. Thanks to great management and ease of entry, we were able to immediately settle into our apartment. The keyless door lock was a great convenience throughout our holiday, allowing family members to come and go with ease. We liked the quieter location on the end of Waikiki Beach, yet surrounded by amenities. We ate at Morimotos next door a couple of times, shopped at the nearby Hilton stores, and walked along the beach until we found a good place to swim. The view from the balcony was nice, over the marina, and we watched some great sunsets. Also, I liked the well equipped kitchen, even though we did not cook. The apartment configuration was good too, allowing everyone access to the one bathroom without waking others up in the apartment. My only little wish would be that the balcony was a little larger to allow for a table outside, but this was compensated for by having the inside dining table by the large patio doors, which we opened up. The apartment was also light filled because of the patio doors. One other small desire would be that we would have had a washer and dryer in the apartment. Overall, I can recommend this place highly and would definitely consider another stay here. It is nice to stay in a place that feels like home. Our condo was very clean and comfortable. The location was excellent located only a few minutes walk to the beach. The view was amazing. I would defiantly recommend this place to family and friends. This is the second time ive stayed at the Ilikai Marina. The last time I stayed on the 5th floor. Unfortunately the elevator was slow and only one on each side was in service, however that is because they were improving them! so next year should be great. This is a great location to Waikiki breakfast ABC store and the sand of the beach. Only bummer on this particular unit was that the bed is really firm/springy, and being that my wife and I are bigger, and the size being a queen we sprung each other off a few times lol. For the price and convenience of having a full kitchen there is really little to complain about. The property manager who handles the rental is awesome. they send you all the details with your room lock number, you get in, grab your car and go straight to the condo and boom! no waiting for check in, not hassle nada. in case you did not know you have to pay for parking, $20 a day not bad and we never had trouble finding a spot close to the elevators, which even in the far corner is not a trek at all. I would recommend this property all day long. oh don't pack beach towels, if you really want wait to get some take home towels at the swap meet or market place...or else you will be bringing back two towels lol. Reservations and checking in were both really easy and stress free. Condo spacious enough for having few friends over for dinners. Location was great being that it was downtown, but not in the heart of Waikiki. Available coolers, extra beach towels, and adequate amount of cooking supplies. We enjoyed our stay and glad we stayed here rather than a hotel. We have already recommended this place to friends, and hope to come back soon! it says it sleeps 4 but really it only sleeps two, the couch folds down it is very uncomfortabl and small. the balcony is so small that you can hardly move on it. the sheets had little balls all over them I had to turn them inside out because it was not soft to the skin. The coffee cups were dirty on the inside I soaked them and scrubed them to try to get them clean and the silverware is very cheep looking, I dont think they get repeat guest I would not stay in unit 1590 again. Mahalo for your review and feedback. We have a new management team in place now and they are making wonderful new changes to my condo. We've purchased a new sofa bed based on your feedback that you can see in the new photos and videos. We understand that the balcony is small, but the spectacular views makes up for it. It's one of the few places where you can see the north end of Waikiki Beach and the south end of Ala Moana Beach in an unobstructed view that you have access to nearly everywhere in the condo - even from the bathroom! You can also enjoy the wonder of fireworks above the lagoon at night..
New linens made of high thread count Egyptian cotton are now available and we've replaced the coffee cups. We've also replaced the silverware. All of the photos and videos are new as of April 2014. Thank you again for your feedback and we'll continue to be responsive to our guests needs. We stayed in unit 1590 for 2 days. It is clean, updated condo. The view of the marina is fantastic. It was such an enjoyable experience I have already recommend the Ilikai Marina Condos to my Travel agent . Everything that was needed was provided for down to the last detail . The view of the sunrises & sunsets were something I will never forget. When we come back again we will definitely book the same Condo . Excellent Security code very safe way to enter & leave the condo . the staff are very helpful & friendly , on our arrival the security guard was most helpful . We liked everything about the condos close to restaurants , shops & transport & the beach . We have stayed in various units at the Ilikai Marina and enjoyed our visits each time. This was no exception. The unit was clean and well appointed. The views are magnificent. The only criticism is that they could of supplied more bathroom incidentals (TP).The good news is that an aBC store is just across the street and they have everything you might need for a short stay. We'll visit again!! Overall we enjoyed our 4 night stay at condo 1590. We are a family of four, with 2 young children and the condo was the perfect size for us. It is well maintained and has a wonderful view. The location was good and we liked the fact it was an easy walk to lagoon, beach or the ala Moana Center. We did walk into the main strip of Waikiki which took around 25 minutes. Management were easy to deal with and answered any questions we had promptly. The only reason I didn't give the condo five stars was because the complex does not have a pool. We knew this when we booked and didn't think it would bother us at the time, but we were wrong. Especially with having two young children a pool would have been good for us. But other than that could not fault condo 1590. Also as a side note - you are able to leave your bags with the concierge at the Ilikai Hotel for a $1 a bag, if you arrive before 3pm or depart after 11am. We found this very handy. This is our second rental at the Ilikai. This time we put up guests for our daughter's wedding. Our guests absolutely loved the condo. We believe there is no better value on the Island and will continue to make this our choice when visiting Hawaii. Mahalo! Condo 1590 at the Ilikai Marina made our Hawaii holiday a wonderful experience. The layout, equipment, views and location of this accommodation made it difficult to find any complaints. Wish we could have stayed longer. Condo 1590 is a very nice appartment on the 15th floor of Ilikai Marina, guaranteeing you awesome views towards the harbour (straight), the Hilton lagoon (left) and ala Moana Park (right). It is a nice 15-20 minute walk to the main waikiki strip but very close to some aBC stores, where you can stock up on some groceries as well as numerours restraurants. Tip: There is a larger supermarket called "food pantry" within walking distance on 438 Hobron Lane.Parking is very convenient (20 $ per day) and the elevator takes you directly to the 15h floor. The 4-digit key code that opens the condo-door is also very handy as you do not have to get and return any keys.The kitchen is remodeled and the bed super comfy. The only minor criticism would be the bathtub that is a bit dated and could use a makeover. Apart from that, the condo has the perfect size for one couple and I would highly recommend it to everyone who is searching for good comfort with a 5 star view in Waikiki. Awesome views and very convenient location! This attractive condo was perfect for our family of 3 (2 adults and a teen). The views of the harbor from the living room and balcony and bedroom were fabulous. The kitchen was well stocked with necessities and we ate a few meals there. The bedroom was separated from the living room by a sliding wall-door. The location of the condo was great -- steps away from the Waikiki beaches and fabulous restaurants -- and a short walk to the mall as well. It was a very good location too for my husband's business meetings in Honolulu. We would definitely stay there again! Ilikai Marina #1590 was the last condo on our recent trip to Hawaii, and it was love at first sight. The description from the rental agent was really helpful and we found the Hotel easily. You can park directly in the complex; for hotel guests it's 20 $ per day. So it was just a short trip to the elevator and up to the 15th story. What a view! The Marina directly below and Waikiki to our left. Every night we stood on the tiny lanai and toasted the sunset. The condo is just big enough for two, obviously recently renovated, clean and comfortable. The bed was a bit firm, but still okay.There are serveral ABC-Stores within a few minutes walking distance where you can stock up on groceries, the Shops at Ala Moana are two bus stops or about 15 minutes walking distance, where you can stock up on absolutely everything...Waikiki Beach with its shops and restaurants wil take about ten minutes walking - and what a beautiful evening stroll it was, under the full moon *sigh.Tip: try the "Red Lobster" downstairs, we absolutely loved our dinner there! We just got back from our wonderful family vacation in Hawaii. Our stay at the Ilikai Marina condo 1590 was a pleasant surprise. The apartment was clean and the views were beautiful, but there were a lot of upgrades which made the condo much nicer than we thought; Starting in the kitchen there was a brand new toaster, new kitchen towels and I believe the coffee pot was pretty new too. The living room chair is new, and there is a beautiful brand new dining room set, the bed had a nice new comforter, sheets, and pillows, and was a lot more comfortable then I thought it would be from reading past reviews. The Lanai is small but not a big deal, we just moved one of the chairs and little table out of the way so we could go out there and enjoy the gorgeous views of the rainbows over the marina, the lagoon by the Hilton, and the breath taking sunsets over the ocean. One of my favorite assets was the front door entry...it has a 4digit code that Kat gives you before you get there, to lock and unlock, so you don't have to worry about those card keys that I always tend to loose on vacation. Thank You to Kat and Jim for everything the only bummer is I forgot my free tote bag. We lucked out finding this rental for the first part of our honeymoon. Every morning we opened our curtains to look out over the marina and we saw some really nice sunsets from there. It was a little disappointing that the lanai was so small but we made the best of it. It was in a great location too, not right on the beach but a short walk away from all the hustle and bustle. It was convenient to hit the store, the Pro Bowl activities that were going on in the Hilton Hawaiian Village as well as access to our friends who were also staying at the Hilton. We couldn't have asked for anything better for the price. If there was one other downside I would say the bed was too hard, but that is personal preference I guess. This was our first stay at the Ilikai Marina Rm 1590, but not our first visit to Hawaii. Pricing was excellent, location, the best, for my wife and I love to work out and stroll around ala Moana Park in the early morning and at night. Waikiki beach is also an easy stroll away. Room 1590 is a single bedroom ocean and marina view, my favorites. Quiet and relaxing with a functional kitchen and living room, it is a great location which I will return to again. The Lani is very small and a bit crowded with the plastic lawn chairs and table. I personally didn't care about this for my wife and I toasted the setting sun each and every evening giving thanks for another wonderful day. During January, the sun shines very brightly into this apartment making it hot,making going onto the Lani impossible until the Sun starts to set. Closing the curtains brings back a more comfortable setting. The bathroom is a standard bathroom nothing fancy, watch the towel rack on the wall, it will pull off if you try to pull a towel out of it..no big thing, just snap it back in place. The bedroom has a queen size bed which is comfortable, the pillows are lacking substance and are thin, so doubling up with two pillows helps. Storage in this room is good. The living room has a foldout sofa bed which is OK to sit on, lying on the sofa pillows gets uncomfortable after a while due to the gap between the pillows on the chair. The single wicker chair pillows are old and very uncomfortable to sit on. I recommend new pillows for that chair, then all would be great. Tv works fine. Beach supplies can be found in the front closet near the kitchen which saves you from buying these items for the beach. Overall my wife and I enjoyed our stay at the Ilikai Marina Condo. We parked in the parking garage on parking level F, 4th floor because there was never any problems finding a parking spot and the elevators are easy to get to. Enjoy your stay at Rm 1590, we did,and will again. Great location, beautiful view, comfortable accommodations! The location was great for the conference we were attending at the beginning of our stay. The last 4 nights we visited with family and took a drive around the island. Our room was quiet and very comfortable. We did not cook, but it was nice to have it stocked with everything we would need if we wanted. ** The connection to the internet needs improvement. The cords need to be replaced. We traveled with our own so it was not a problem. Plan to shop for groceries before you arrive at the condo, you are in a resort zone, so no food stores nearby. Watching the Friday night fireworks was a nice surprise! Very nice location with beautiful view of the ocean.Studio large enough, well designed and very pleasant.We can separate the living and sleeping.The studio has a high level of maintenance and is very well equipped.Some facilities deserve a change as they begin dating.Parking very convenient with direct access.Conclusion: I recommend the condo in 1590 in which I made ? ?a very pleasant stay. Our stay at the Ilikai Marina was great. We loved the location, ammedities and the view was fantactic. The friday night fireworks were a great plus. Really enjoyed our stay at the Ilikai Marina condo 1590. The apartment was really clean and comfortable. The view of the marina is spectacular, particularly during the fireworks on friday night. The condo was very clean and basic, well stocked with many handy items for use on the beach, such as straw mat, boogie board, etc. Very nice scenery.The hallway is a little bit run down but acceptable. Easy access to aBC Store and eateries, almost walking distance to the large mall and Wakiki Beach. The firework on Friday night at 9 was quite spectacular.Parking is not as convenient, the parking below was $7 for 10 hours or you pay $20 for the whole day. Free parking on the left hand side is only for a maximum of six hours per day. The meter is a dollar per hour. The view was excellent - the best part of the experience, but there were numerous problems. The deadbolt key did not work--difficult to deal with for the new and tired arrival. The bed was so hard and uncomfortable that my husband had to sleep on the pull out sofa (first time he has ever slept away from me). There was no flat sheet for that bed. The coffee pot was too small for the coffee machine so didn't release the coffee. But Jim and Kat responded and resolved problems immediately. But why so many problems?? We expected a relaxing vacation, not a series of problems to resolve. Thank you for noting that your concerns were addressed immediately. For a follow up, the dead bolt that you had trouble with was replaced with a new keyless electronic entry security system. For Guests that need a softer mattress, we added a mattress topper to the inventory. Every rental is supplied with a complete set of sofa sleeper bedding located in the closet. We replaced the coffee maker on the same day with a new coffee maker. Our staff is always ready to help with any of our Guest's concerns. Unit was clean, well appointed and stylish. Comfy couch. The bed was a little stiff, could be improved with a mattress topper. Great view, restaurants on first floor, convenient and reasonable parking. Stayed here as we are selling a home here on Oahu but live in California. I wanted to stay in Waikiki to be close to the action. This place is a gem. So it's just a bit dated and you don't have housekeeping service daily but I had access to a washer and dryer (& they are available here on the property). You have an amazing ocean view & Hilton Lagoon view which can't be beat & the parking garage and things to do are right down stairs and you can't beat that! Consider this place it is well cared for! Kat, the condo manager, was always very professional and friendly and promptly answered all the queries we had prior to our stay. The location of the condo was ideal. Far enough away from the noise of busy Waikiki beach but still central to transport, shopping and sightseeing. The room was clean and tidy and great value for money. The view from the balcony is to die for. We will definitely be seeking Kat for another booking again in the future. I was in a hurry to find a place to stay in Honolulu as I had a job interview that came up suddenly. I had stayed at the Marina before and found that it was the perfect location. Happily, Condo 1590 was available for the dates I needed on a short notice. The place was perfect for what I needed. It is clean and has all the necessary requirements for my stay. Being on the 15th floor allows you to see everything. I will stay there again when I come back to Hawaii. Great for the money! Our stay at Ilikai Marina Condo 1590 for a week at the end of March 2011 was an outstanding experience marred only by the accidental severing of the water mains by road constructors (happily only hours before we shifted out). Checking in and out was painless (not least because of the detailed information supplied beforehand) and the condo itself was perfect for our needs. Moreover, with a balcony looking out of the waterfront, this was indeed a case of experiencing Waikiki in the front row but at an affordable price. We had a wonderful, restful fun time. We stayed in a 15th floor condo, with our family next door. The condo is in a perfect location, close to shopping, beach and restaurants. I liked the fact that we were privded with beach towels, beach chairs, umbrellas and mats. The only negative for us was the size of the balcony. We love to sit out on a balcony and see the water, however it really is only big enough for one person. This is our only disappointment. This condo was exactly as it was described on the website. It is not new and glamorous but was very clean and a reasonable price. The fully equipped kitchen saved us a lot of money in meal costs. Communication with the property manager prior to arrival was great! The only negatives are minor: 1. the lockbox on the door for the keys was a cylindrical combination lock, not with buttons as described in the arrival instructions. 2. The bed in the bedroom was quite hard and uncomfortable. 3. Read the instructions on the back of the front door for the correct instructions on connecting to the wireless. Other than these small quibbles, it was a positive experience. The apartment is well located and is very clean, neat and well stocked. The security staff when we arrived was very helpful and pleasant. Areas of improvement: fresh towels daily or every other daythe bed could be a little more comfortable. I stayed with my adult (21 years old) daughter. We loved Oahu and enjoyed our stay at the Ilikai Marina!!! Our condo was clean and in a very good location with beautiful views of the ocean, close to the beach, shopping and restaurants. Perfect setup for a family with teenagers is to be where the action is.Thank you Kat for all that you did and for all your help. We really appreciated!!! Happy 2011!!! Booking through alohacondos.com was easy and flawless. The unit was as advertised, very clean, well appointed, comfortable and had everything we needed. It made for a very relaxing, easy holiday. Great views and sunsets from the balcony overlooking the marina. It's not located in the thick of Waikiki beach (the sandy beach is a short walk away), but is much better value than the hotels there, and for our family, it's nicer to have a "home" to hang out at. Very convenient walking distance to the huge ala Moana shopping mall, which has everything you might need. My wife and I along with another couple stayed in Condos 1590 and 1592 for a week. The condos were great, clean and comfortable, with fabulous views. The location was superb, only minutes away from everything but in a very quiet setting on the marina. Can't fault a thing, we had a wonderful time and would recommend it to anyone. A very clean and well kept condo with all facilities provided. Handy to the beach and the ala Moana centre. Good pub and restaurant next door. All in all, great value. We have just returned from our stay in Condo 1590. All I can say is the view is impressive. The condo on a whole is comfy& clean, the kitchen has been revamped, so cooking is no hassle, bathroom adequate.Waking to the view, of ocean,boats,people in water,planes,ships it never stops,but that adds to the atmosphere of this apartment. We didn't dine out, instead we bought dinner at Red Lobster (next door), drinks from the aBC store across the street, raced upstairs & sat at the table & watched the lights of the surrounding area. The fireworks on Friday night (8pm) what a bonus. The downside - the bed was hard.The added touches of tote bag, pen & notepad - very handy, chocolates on the bed, also the use of beach towels & umbrella - very thoughtful. We actually stayed twice in the same apartment on return trip from Big Island.Also the booking agents were very helpful & willing to answer all your queries. I could see myself staying longer!! We had 2 condos for our family vacation one on the 3rd floor and one on the 15th floor.The view was just that much better from up there.Watching the morning surfers was like a ritual for me at breakfast time and the sunsets are just postcard from the balcony.Thanks again Kathaleen!!Mahalo!! I reserved this place for my extended family to attend a conference and was a bit worried because I didn't get a chance to check it out first. It is apparently close to the heart of downtown with easy access to restaurants, groceries and shopping and the views are great. I am looking forward to staying here when next I go to Hawaii. Beautiful View - Fantastic Sunsets! I enjoyed the fact that there were beach chairs, umbrella, towels & boogie boards for our use. Very thoughtful. Also enjoyed the well-stocked kitchen. The bed was very comfortable & I appreciated the sliding door between the bedroom and living room. The location gave us no choice but to walk and the exercise did us good! The view is just amazing. Truly beautiful experience! We had a great stay at Ilikai Marina #1590. This is a great ocean-facing condo. A bit far away from the action of Waikiki beach but pretty close to the family oriented activities in the Hilton Hawaiian Village. Service was impeccable with a local representative - Kat - who stays on the island. she can take care of all your needs right away. We had a late flight and Kat graciously extended our check-out time. With two small kids, that was a life saver. Will definitely recommend to everyone. Best Location You Could ask For! The unit exceeded my expectations...not new but well maintained and very clean. The bed was very comfortable and the view was spectacular! Fortuantely I was there during a full moon and the moon over the ocean and the lights in the Marina below was something like you would see on a postcard. The location was perfect. Very central to everything. I didn't have a car so I avoided the $17/day parking charge by using the city bus and trolley system. You can get everywhere you want to go on the island for a very minimal fee. Went to Pearl Harbor for $2.50. The Fireworks at the Hilton on Friday night were spectacular. Traveling alone I felt very safe with the security guard on duty down stairs. Kat is my hero. She made my first trip to Hawaii the best experience I could have ever hoped for from answering all my questions promptly via e-mail before I booked the room to calling me after I arrived to make sure I had everything I needed. Kat! You're the best! Excellent! We would definetly stay again. I ended up in Honolulu by myself with family members staying at a hotel on the strip. I felt my accommodations were far better than theirs, and for about the same price. I had a gorgeous view of the Gilligan's Island marina, they had a view of the roof of an adjoining building. They were smack in the middle of the touristy area, I could get to it and away from it at will, which I loved. The staff at aloha Condos could not have been more helpful and bent over backward to take care of me. Also, you are right next to the Hilton Complex, which is huge, and easy to access. You can use their stores and restaurants, and their beach, and no one bothers you. It is kind of fun to watch all of the weddings that constantly go on during the weekends. The closest Starbucks is also over there. Proximity to their grounds more than made up for the condo not really having much of a lobby area...and they have fireworks on Friday evening which are really close to this condo. A couple of hints. Don't rent a car and don't use the cheesy tourist trolley: it is way overpriced! Also, you'll spend all of your time trying to find parking in the Waikiki area. The city bus is easy to use, especially if you have Google maps on a PDa. Each trip is $2.25, and if you make them give you a voucher for the return trip then that is for free. $17 a pop to keep a car overnight seemed high, and aloha Condos makes sure that everyone understands that cost. You can rent a car in three separate places near the condos if you want to tour the island for a single day or two. Don't take it into the downtown areas at night...oh, and they have a guard on duty at the harbor condos every single night. I really appreciated that! Felt safe everywhere but downtown Honolulu (not the tourist strip, but over where the government buildings are) in the evening, even though it was still light out (had a function I had to attend). The self check in was hassle free and fast. Nice view of the Marina and clean unit overall. Service was fantastic and the contact person was very helpful. Good location next to Hilton village which is near to Ala Moana Mall and along the waikiki beach stretch. PArking was pricey thou.